Celebrating 30 Years of the MX-5 Miata begins with celebrating our fans and their stories. We asked owners and enthusiasts from around the country to submit their MX-5 stories to celebrate the debut of the 30th Anniversary MX-5 Miata at the Chicago Auto Show. After graduating from college, Zen Yieh launched a search for a “fun” car that he could keep for the rest of his life. After reading dozens of enthusiast magazines, Zen decided that a MX-5 Miata was the perfect choice. “All the enthusiast magazines said the Miata's one of the great cars to have -- that you'd want to keep, something worth owning,” Zen said. When Zen and his now wife went to test drive the MX-5, he was sold without ever driving the vehicle himself. “My wife test drove a bunch of these cars. I couldn't even drive the darn thing because I didn't drive stick though I always wanted to learn,” Zen explained. “She actually drove stick. We test drove the car, and thought it was awesome. I said to her, ‘What do you think?’ and she replied, ‘I think we should get it.’"
Zen had been riding motorcycles for a long time, but never had driven a car that was manual. “It took me awhile, but I learned how to drive stick in that car,” Zen said. At the time he bought the car, they were semi-recent California transplants. As such, they wanted to get out and explore their new home state. Ten years later, the couple had a daughter, so both his wife and mother-in-law insisted that the couple buy another car for the baby,” Zen explained. 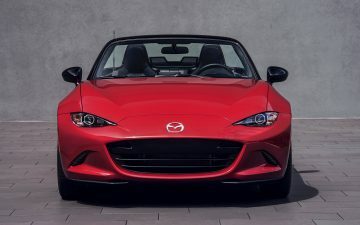 “I will drive our daughter around in the sedan, but I'm keeping my MX-5." Now that his family no longer needed the car for day-to-day transportation, Zen was able to begin modifying it. “Piece by piece, I turned it into a weekend autocross car,” Zen said. The MX-5 also doubles as a jungle gym for his daughter. “She would play with the stick shift and pull on all the levers,” Zen explained. “She liked to press all the buttons, turn on all the lights. She kind of grew up in it even though she didn't drive in it.” Now that his daughter is old enough to ride in the MX-5, it has become the family car.